With the changing trends in gender equality, women employees in various sectors are growing fast in numbers. While women have traditionally been associated with health care, hospitality and education, they have also proved to be a dominant force in several previously male-dominant fields like management, finance etc. and have recently grown in almost every field of employment. From armed forces to law, women have been equally competent with male employees and workers in recent times. Several researches and surveys suggest the growing prowess and success of women workers in several previously male dominated sectors. If you are woman who is looking for the best employment opportunities with female friendly work environment, here’s a list of the top industries which would suit you the best. Women have been known for their shopping and have been the target of several shopping campaigns by advertisement agencies since ages. Women are said to hold the buying power in a family which makes them great in the E-Commerce sector. Several e-commerce industries prefer the expertise of female employees as compared to males. Women have a better understanding of the buyer’s mentality and are particularly more effective in the E-Commerce and online auction business. According to recent reports, the tire manufacturing industries have increased the female jobs by a considerable margin of 16.8%. Due to a higher number of women graduates as compared to men, companies are aimed at hiring more skilled and qualified employees. With the growth of the automobile industries across the globe, tire manufacturing is a booming business and requires qualified and skilled employees. With the increasing number of women among the available population of qualified and skilled professional tire manufacturing industries are a recent favorite among the women employees. Nursing and care giving has been a long associated career sector that has been dominated by female employees. Most people when opting for home care services demand the assistance of female care providers. Caring comes naturally to women, and home care is one of the most stable industries for women employees. While the average salaries in the home care sector are low compared to the other female dominated industries, getting employment is surprisingly easy due to the high demand of female care givers. Oil Drilling and working on offshore rigs has always been associated with male employees. However, due to a higher number of educated and more skilled women employees, oil drilling is the new favorite for the women employees across the world. According to recent reports, the presence of women in the oil and gas extraction industries has grown at a considerable rate of 11.6%. Most of the technical aspects of the oil drilling industries have increasing become female dominated with their average annual salaries totaling upto $132,000. For centuries, education has been one of the major strongholds of the women employees across the world. Education industry has one of the most stable demands for women teachers and employees since several hundred years and provides the most decent of salaries for the working women with several additional perks. According to recent surveys, women in the teaching industries are few of the most satisfied employees across the world. Let’s face the truth, women dress better than men. When looking in a crown, one can often spot a higher number of sloppily dressed men than women. Women are naturally better at judging the quality of a particular fabric and pay more attention to detail while dressing. Fashion industry is one of the most female friendly environments across the globe and has been prevalent with women both on and off the runway. Creating, wearing and buying clothing are the various activities that have been most commonly associated with women around the world and it makes them perfect candidates for the fashion industries. While the status of women employees across the world is growing in the right direction, there are several industries which have been long standing monoliths of women empowerment. 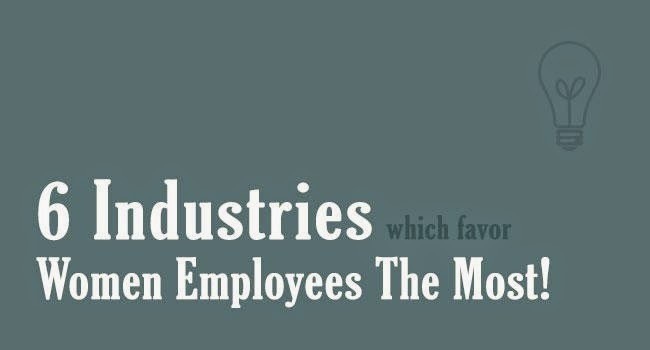 The above mentioned industries have been shown to be few of the most favored workplaces for women employees. With a stable economy and demand for skilled workforce, women are slowly and gradually taking over the previously male dominated industries. About the author: Luke Peters is the current contributor for Findingitjobs.co.uk which is the best way to find UK IT Jobs. He likes reading about topics like finance, management, marketing and law and has written several articles related to the respective topics across the internet.